NEW RELEASES – Just In! Paydirt 2017 'Going For Broke' Red Blend, Paso Robles Prisoner fans will love this! Prisoner fans will love this! Our friend Patrick McNeil makes this small-production gem sourced from some of Paso Roble's best vineyards with McPrice Meyers as winemaker. 94 Points Brix26: "The 2017 'Going For Broke' is bursting with freshness and ripe berry fruit. The Zinfandel provides a soft, round, and juicy base for the blend, and the Syrah is deep, spicy and saturated. The Petite Sirah, Grenache, and Mourvedre provide the perfect blend of aromatics: Dark fruit, leather, and the almighty spice rack. The tannins are well-defined and balanced by high natural acidity." New release! One of Napa Valley's Classic Cabernets. Caymus Special Selection Cabernet Sauvignon is the only wine in the world twice honored as "Wine of the Year" by Wine Spectator Magazine. previous vintage 95 Points Wine Spectator: "This zeroes in on a rich, hedonistic core of wild berry, blackberry, plum and currant flavors, with a graceful, elegant mouthfeel and supple, caressing tannins. The long and powerful yet refined aftertaste keeps reverberating fruit generosity while maintaining Cabernet's strength of personality. Drink now through 2030." Varner 2014 Upper Picnic Block Pinot Noir, Santa Cruz Mts. A fantastic Pinot from one of our favorite Santa Cruz Mountains producers! Limited. 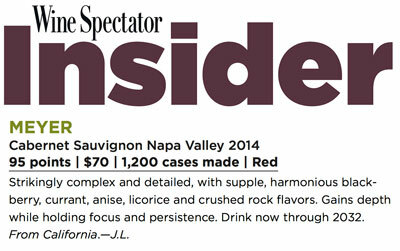 95 Points Robert Parker: "Wafting from the glass with notes of ripe red cherries, cassis, dried flowers and subtle hints of pencil shavings, the 2014 Pinot Noir Upper Picnic Block is beautifully supple, satiny and medium to full-bodied on the palate, with an ample and expansive core of sweet, ripe fruit that's balanced by succulent acids and plenty of incipient savory complexity. It's a beautifully balanced, giving wine and a superb valedictory vintage for the Varner brothers. Drink it now or over the next decade." New release from Hestan Vineyards and Napa's most sough-after winemaker Thomas Rivers Brown! One of the best Cabernets of the year. Limited. Previous Vintage: 95 Points Wine Spectator: "Strikingly complex and detailed, with supple, harmonious blackberry, currant, anise, licorice and crushed rock flavors. Gains depth while holding focus and persistence. Drink now through 2032."